Soooo, speak no evil, see no evil, and give the finger? 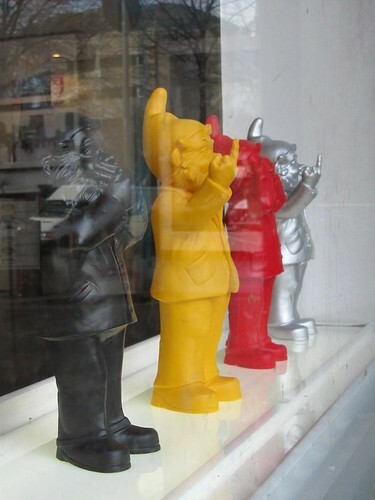 I was en route out from the Chester Beatty Library today when I passed by Gallery Number One and spotted these chunks of gnomes at the windows. I had a double take when my assumption of “gnomes reenacting hear/speak/see no evil” turned out to have implants between them who happened to be a little rude. The gnomes also reminded me of the travelling gnome à la Amélie. You know, the one which was posed at various famous landmarks so photos can be snapped? I think that’s a pretty sweet idea, except it would be hell should one flies low-cost and does not check any luggage in. That gnome can’t be light. However, I must say, if I could find such gnome as a plushy, I probably wouldn’t mind doing my own version of The Adventure of Travelling Gnome. Do you know where I can find one? hope is always around with me, just not on photo much, true… poor guy. lol… which dwarf would do that?